Earlier in the week, Daddy & Mummy took leave to bring us out for a day of fun since it was the school holidays after all. Hee hee... And when the decision-making came down to kor-kor & me, we unanimously agreed on Polliwogs! See how kor-kor was filled with glee the moment we stepped inside? Hahaha... Can't blame him, I was also raring to go, erm... jump into the ball pit! 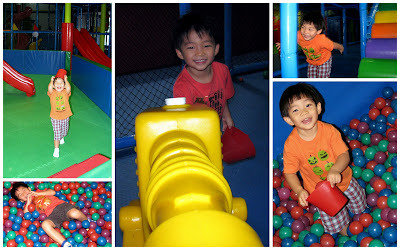 We sure enjoyed ourselves for the full morning that we were there; slides, ball cannons, tunnels, ball pits - we were so deeply immersed in playing that no wonder Daddy & Mummy could peacefully read the papers & drink kopi. Lunchtime was even pushed back slightly so that we could continue to wreck havoc inside - hmmm, that must have been our lucky day! Heh. The setting was extremely informal inside the concert hall; all kids were encouraged to clap along, do funny actions & wave our finger in the air as if we were conducting the orchestra. It also helped that the music that was played were all familiar classical pieces. Naturally kor-kor & I were very participative lah! At the end of the performance, all kids (sorry, Daddy! :P) were invited up onto the stage to mingle with the members of the orchestra, and also to get really close to the many instruments that we heard just now.